Essentials needn’t be just a necessity. This micro USB car charging kit does exactly what it should; help to keep your favourite gadgets are always fully nourished with the power they need to get you to your destination, sing along or just take that all important call. 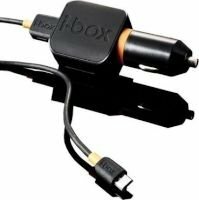 i-box believe that chargers and cables should be just as desirable as the vehicle they are housed within and the products they serves, if not more so. This USB to Micro USB car charger is suitable for most smart phones and tablets.